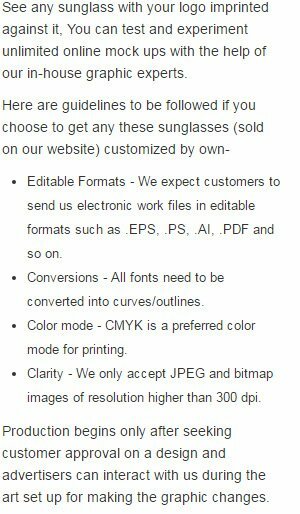 Custom folding Malibu sunglasses is an affordable choice for marketers and they are largely showing up around beaches. They make a perfect giveaway during summers and throughout the year. These sunglasses fold down to convenient size and they can be managed within pockets or bags with ease. These sunglasses can bring you big exposure during marketing events and tradeshows. Personalized folding Malibu sunglasses last longer because they are produced using polycarbonate material, which is strong enough to bear wear and tear. Highlights –UV400 lenses provide 100% UVA & UVB protection. Dark lenses and colored frames. Colors - White, Red, Navy, Royal Blue, Lime Green, Black. Available Colors : White, Red, Navy, Royal Blue, Lime Green, Black.